Longlands Farm grows cereals on the arable land and also breeds the Dorset Longhorn cattle, which graze more than 150 acres of chalk downland. They are traditionally reared on a grass, hay and silage diet with no concentrates or chemical additives. The cows and calves live out all year round. 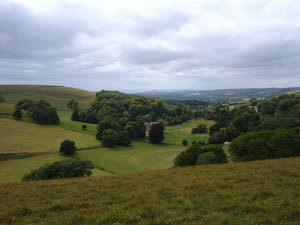 The land is managed for conservation, without the use of chemical fertilisers or herbicides. The area is home to an abundance of flora, including a number of species found only in this type of pasture. It also includes the well known nature reserve ’The Valley of Stones’ as well as a number of Sites of Special Scientific Interest (SSSIs). We cure all our own bacon and cook our own hams on the farm. The pork for this is reared on a neighbouring family farm where traditional methods and high welfare standards are maintained. The bacon is cured in our shop using a dry curing process which is slower than the methods used by modern mass producers, producing a noticeable better flavour. Our lamb is reared by the same neighbouring family farm to the same high standards. If you have any more questions about the farm and how we look after our livestock or just want to have a chat please drop by the shop, give us a ring or get in touch using the contact page.